MCSP antibody LS-C18861 is an unconjugated rabbit polyclonal antibody to MCSP (GPX4) from mouse, rat and guinea pig. Validated for ELISA and WB. GPX4 / MCSP antibody was raised against synthetic peptide from mouse GPX4. Amino acids near the carboxyl terminus of mouse GPx4 protein. This affinity purified antibody has been tested for use in ELISA and western blotting. Specific conditions for reactivity should be optimized by the end user. Expect a band approximately 19 kD in size corresponding to GPx4 protein by western blotting in the appropriate cell lysate or extract. Store vial at -20°C or below prior to opening. For extended storage, aliquot contents and freeze at -20°C or below. Avoid freeze-thaw cycles. Dilute only prior to immediate use. Anti-GPx4 Antibody - Western Blot. 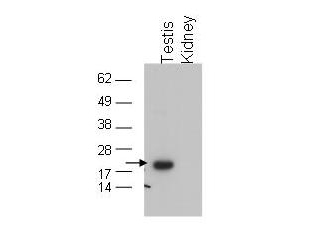 Western blot of affinity purified anti-GPx4 to detect GPx4 in testis extract (arrow). tissue extract (40 ug) was electrophoresed and transferred to nitrocellulose. The membrane was probed with the primary antibody at a 1:1000 dilution. Personal Communication, Dolph Hatfield, CCR-NCI, Bethesda, MD.